The communities along the Oregon coast now how to celebrate Independence day. There are many different options to choose from if you are looking for a good time this upcoming 4th of July weekend. There will be lots of family friendly events and a few places for adults to party as well. The following cities will be holding firework shows on either the 3rd or 4th. Rockaway Beach is home to a full weekend of fun. The firework show begins at dusk and is hosted by the local fire department near the Wayside. Get a spot on the beach and enjoy the show. During the day the morning is the local parade. The Lions Club will be putting on their Fun Day at the Beach with activities for kids and it will be the 8th annual Firecracker Weiner Nationals dachshund races at the local park. The Manzanita parade starts at 1PM. The city sanctioned fireworks display is planned to start at 10PM on the beach at Manzanita, the show is expected to last about 20 minutes. 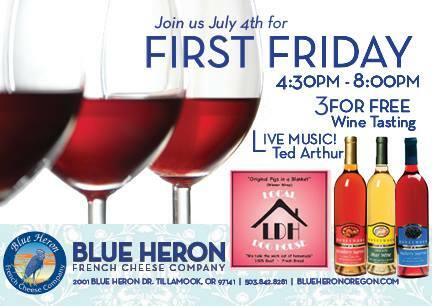 The Blue Heron is the place to be if you are in the Tillamook area and looking for a more adult friendly environment. Live music and wine tasting. 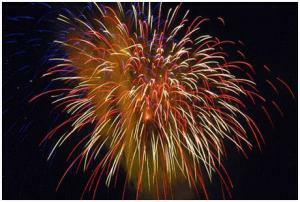 The Seaside chamber of commerce puts on a great family fun focused Fourth of July celebration. There is a ton of activities in Lincoln City this weekend. Here is a brief schedule of events. Dusk Fireworks show over Siletz Bay. If you decide to do a little shopping at the Tangier Outlets in Lincoln city make sure and take advantage of these coupons and any other special holiday discounts that may be going on. Depoe Bay no longer holding fireworks display due to bird sensitivity. Enjoy the fun and whimsical la de da parade at Noon that is put on by the Yachats Area Chamber of Commerce. The afternoon is the mouth of the river is home to a rubber ducky race in the river and in the evening there will be a public fireworks show. There will be live outdoor music in Old Town and a fireworks display over the Siuslaw river. Local shops and restaurants will be open late to accommodate people out celebrating the holiday. In the course of establishing a Veteran’s Day Parade, Cal Applebee realized that approximately 1,300 World War II veterans are dying each day, and that number does not include Korean War, Viet Nam War, Iraqi War or Afghan War veterans. He began wondering what would become of all the artifacts and mementos they left behind. Not only that, but their stories would be left untold. These musings inspired a group of local veterans to lay the groundwork for the museum. The fact that an astonishing 21% of the residents of Florence are veterans makes this the ideal location for the museum. This dedicated group of volunteers is working hard to make their dream a reality. They have struggled to raise money (they are a 501C organization) for the construction of the museum, which will be located near the Florence airport. They are very frugal, getting materials and labor donated, and even getting the Oregon legislature to allocate $41,000, to help with fees, permits, and to bring electricity to the site. The land for the museum is being leased from the city of Florence. They have held several fundraising events, such as concerts by Pacific Coast Wind Ensemble, Remembrance Bricks purchased in memory of a veteran, and having people ‘buy’ parts of their building. The two main goals of the museum are honoring veterans and educating the public. The group is not waiting for the official building to open; they are going ahead with achieving their goals. The Freedom Remembrance Wall and memorials to several solders are already in place. They have displays that include old rifles, posters, radio equipment, and authentic Nazi propaganda postcards with pictures of Hitler on them. The group is also attending events with vehicles and displays and trying to educate the general public. Group members have been surprised by how little the youth at the events they have attended know about U.S. history and the military. They want young people to know about the sacrifices that have been made to make America what it is today. The volunteers feel that sharing the oral histories they are gathering with young people will help them understand their history better. The group’s website at http://www.kilroycorps.com/ contains an enormous amount of information. The story about how the idea for the museum got started, a slide show of the dedication of Remembrance Wall, archives of all the group’s newsletters, and a collection of articles about the military, the involvement of the military in Oregon, and much, much more. You can learn a great deal by visiting the website. However, don’t wait for the building’s construction to be complete. You can visit the museum in its temporary house in an airplane hangar at the Florence Airport. The construction of the buildings for the museum and gift shop is nearing completion. The Oregon Coast Military Heritage Museum is a reality. 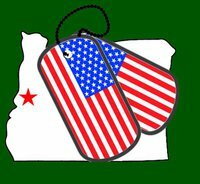 For more information check out the Oregon Coast Military Heritage Museum site. 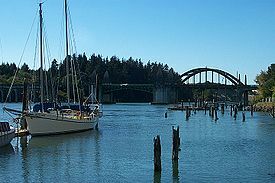 Florence snuggles between the Siuslaw River to the west and south and the North Fork of the Siuslaw River to the east. The northwest corner of Florence meets the Pacific Ocean. Florence has a little of everything. Slightly to the north of Florence you will find Sea Lion Caves. Several varieties of birds and the sea lions make their home in these sea caves. The huge cave is filled with sounds from the sea lions, the birds, and rhythm of the waves. You may well want to cover your ears to block some of the noise. A little farther south is beautiful Heceta Head Lighthouse. It is one of the most photographed lighthouses in Oregon. It towers 56 feet above the top of Heceta Head, which is 205 feet above the ocean. The automated light installed in 1894, is still the strongest light on the Oregon Coast. It can be seen 21 miles from the coast. The lighthouse is currently closed for renovations, but it still a great place to stop and enjoy the view or hike in the area. You can also see how many of the over 450 different birds identified in the area you can spot. Old Town Florence has the charm and friendliness of by gone days. The streets are lined with beautiful flower boxes, benches and the Old Town Gazebo for resting and enjoying the sites, and charming shops with unique merchandise to peruse. Browse the art galleries, gift shops, and be sure to check out Nan’s White Rabbit Cottage. Nana’s has a constantly changing inventory of antiques, glassware, ironwork, linens, china, jewelry, candles, and other unique gift items. Since Florence borders both on the ocean and the Siuslaw River, so you can enjoy water sports such as fishing in either place. Florence’s beaches are great for crabbing, diving, kayaking, paddle boating, scuba diving, snorkeling, swimming, surfing, water-skiing, or windsurfing. Florence is perfect for kite flyers’ and horseback riders as well. Horseback riding on the beach is available with C & M Stables. The equipment you need for most of these is available for rent at reasonable rates in Florence at Central Coast Water Sports. A newcomer to Florence is the Oregon Coast Military Heritage Museum. It was the brainstorm of Air Force veteran Sam Spayd that got the museum started. The museum, housed in an airplane hangar while the museum is under construction, already has displays that contain old rifles, posters, radio equipment, and authentic Nazi propaganda postcards with pictures of Hitler on them. South of Florence is Oregon Dunes National Recreation Area. Here you will find giant sand dunes, extending to nearly 500 feet high and almost 3 miles wide. The dunes go all the way from Florence to Coos Bay. You can take a dune buggy ride through the shifting sands or go horseback riding. Either way you will have an unforgettable experience. Florence offers some incomparable activities. Come, explore, and enjoy! Fore more information about Florence Oregon check out these links.